is a superb book – but it is not for everyone. Luang Phabang – an Architectural Journey (ISBN 0-9747847-1-0, publisher Ateliers de la Peninsule, 2004) truly is an architectural journey through the old city of Luang Phabang. The material in the book was collected for the proposal to UNESCO, to nominate Luang Phabang for world heritage listing in 1994. Incidentally, it was then listed in 1995. The book is split into several sections covering the history and legend, tourism, evolution of the city, the architectural blend, religious architecture and finally cultural survival. The history of the region, and indeed in its relationship to Thailand, stems from the migration of the Tai speaking peoples as they came through the countries that eventually became Laos and Siam. Luang Phabang dates back to 1353 (not long after Chiang Mai) and was the capital of the area known as Lan Xang and ruled over by Chao Fa Ngum. After the seat of power was moved to Vientiane, Luang Phabang went through a period of decline, finally being sacked in 1887. The overlapping monarchies are mentioned, including the times when Luang Phabang was a vassal state of the Bangkok rulers. Of course, the French also had an enormous influence on the city, being as it was in French Indo-China, and it was they who were responsible for the reconstruction which began in 1895.
the progressions and the melding of the various styles. The buildings are examined by function (e.g. shop houses, residences, government buildings or religious temples – known as ‘vats’ as opposed to the Thai name ‘wats’) and the differences in each explored both in real time and in construction methods and styles. The review copy came from Bookazine where it has an RRP of B. 1,500. Not a cheap book by any stroke of the imagination, but one that tackles its subject with so much attention to detail it is hard not to be totally engrossed. This book is definitely worth your attention, as a resource material if not-hing else. As I stated in the beginning, I loved it, but it won’t be for everyone. First of all, Merry Christmas from Mott the Dog and Meow the Cat. Christmas is always such a good time of the year. Happiness to all humans and animals. At Number Ten we have ‘Do They Know It’s Christmas’ which was written by Bob Geldof (of course now Sir Bob) and Midge Ure. It was number one all over the world at Christmas in 1984, raising money for children in need, and featuring just about every top pop artist from the United Kingdom from ‘Status Quo’ to ‘Bannanrama’. It may not have been the greatest song ever written, but it was certainly the one with the biggest heart and the best intentions. Over the years it has raised over fifty million pounds for worthy children’s causes. A song that warms your heart when you hear it. On the last ever Bing Crosby Christmas show there was a wonderful duet between the man himself and David Bowie singing ‘Little Drummer Boy’, which comes in at number nine. The two stars’ voices compliment each other superbly, and the spectacle of them standing at the fireplace together is heartwarming, although it is quite apparent that Bing Crosby is not actually sure who the young skinny chap with the bad teeth is that is singing with him. To give the Christmas chart a bit of street cred is the Boss himself Bruce Springsteen, who with the E Street Band gives us a raucous live version of ‘Santa Claus Is Coming To Town’. The band have a very festive time blowing the cobwebs off this old chestnut, with solos from all the musicians blasting out all over, whilst Springsteen himself roars out the vocals. Worthy of a Christmas number eight placing. At number seven is the Father Christmas of Pop Elton John with ‘Step Into Christmas’ from 1995. A typical Elton John rocker, it is the perfect vehicle for Elton to make his mark on Christmas, and of course give him one more chance to dress up. For all the charity work that he has done over the years who could possibly begrudge Reginald Dwight a place in the Christmas top ten? Number six, probably the most unusual entry, is the Christmas smash hit from 1975 with Greg Lake and ‘I Believe In Father Christmas’. Who would have thought that the voice and bass guitar from heavy progressive rock giants King Crimson and Emerson, Lake, and Palmer would have come up with a Yuletide hit? This is not some novelty song, but a great song, with a wonderful tune, brilliantly executed musically, particularly showing off Greg Lake’s rock throat. As we move into the top five, Wham’s ‘Last Christmas’ may not exactly be very rock ‘n’ roll, but you cannot deny that it is very Christmassy, and a real toe tapper to boot. What exactly Andrew Ridgley did on this song I am not sure, but these days I am sure he is glad of the royalties. George Michael turns in one of his vocal performances, which showed why he remains to this day one of the pop world’s leading superstars. Glam Rock in the early Seventies produced many a fine Christmas tune, and at number four I have put Mud’s ‘Lonely This Christmas’ from 1974. Not, I will admit, the most cheerful of ditties, as Christmas is certainly not the time of year to be on your own. But Les Grey’s wonderful Elvis Presley impersonation on vocals is simply irresistible, and perhaps this song adds a bit of balance to the gaiety of all the others of its time. After being a member of both The Move and The Electric Light Orchestra, Roy Wood blew into Glam Rock with a vengeance when he form his own band Wizzard. Like a multi-colored Santa Claus, Roy Wood led the band through many hits, the best of which was probably ‘I Wish It Could Be Christmas Every Day’ with its fantastic chorus and Phil Spectrish wall of sound. Even though it was a massive hit the single was still supposed to have lost money and split up the band, such was Roy Wood’s insistence on perfection and multi-layering the sound time and time again. But in the end it was certainly worth it. A Christmas song that was released from the heart, and certainly plucks a few strings, is John Lennon’s ‘Happy Xmas (War Is Over)’. At any time of year this song would have been a huge hit, and delivered a very strong message. You cannot help feeling that John Lennon threw all his musical ability and strong personality into this song; the fact that it is regarded as one of the all time classic songs is a great testament to its writer. The message of ‘Happy Xmas (War Is Over)’ is as relevant now as it was when it was written. 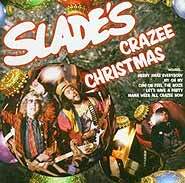 Slade’s ‘Merry Christmas Everybody’ reached the top spot in 1973. It has since been released almost every year, and always makes it towards the top of the charts. In 1973 Slade were probably the biggest pop band in the British Isles, and the fact that they wrote the all time Christmas party record only enhanced their status. With Noddy Holder’s infectious loud hailer vocals, the screaming guitar of Dave Hill, and the thundering rhythm section of Jimmy Lea on bass and Don Powell on drums, it is guaranteed to bring any party up on its feet and dancing. Whenever Slade play these days, even on a mid Summer day in July, they have to bring along their own snow machine so they can have a quick run through their most famous song. There are of course plenty of other jolly good Christmas songs; this is merely a selection of Mott’s favorites. One song that should be in there, at the top of the tree is Bing Crosby’s ‘White Christmas’ but I just could not make up my mind which category to put it in. Once again, as Noddy Holder finishes off, “Merry Christmas Everybody”.